So, if you told me I would be cheering loudly, high-fiving the other riders, shouting motivational phrases like 'I AM ENOUGH' at a spin class, I would have laughed in your face and said no chance. I don't even like it when the instructor shouts something that requires a lacklustre response of 'yeaaah' to try and get the energy up. I'm here to spin, not to cheerlead. That was until I attended my first (and most definitely not the last!) 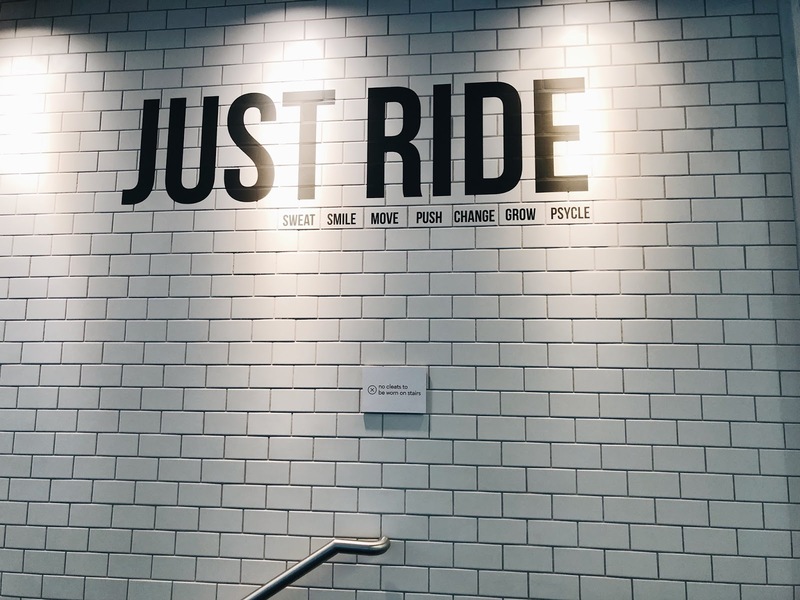 spin class at Psycle London. It puts every spin class I have ever done to shame. I feel like with something like spinning, if the instructor brings the energy, it spreads so quickly and you end up having a really good, sweaty, workout. If they can't be arsed, then you can't be arsed, and then it's a waste of 45 minutes that you could have been laying on the couch watching Come Dine With Me re-runs. Here, the instructors are absolute machines, the energy is through the roof, the technology is second to non, and the actual interior of the building is so minimalist and chic- a faaaaaaar cry from my old gym in Wakefield. I thought it was going to be really clique-y and the other riders would spot the newbie from a mile off, but the class was PACKED, the room is dark (apart from neon lighting on the room- v. cool) and the music is loud so you wouldn't have chance to lean over to your pal for a quick chat even if you wanted to! Not to mention, they reinforce the whole 'community' vibe. You have to wear clip-in shoes (NO ESCAPE!) and Alana helped me clip myself in and position my bike to get ready to ride! When I mentioned earlier about cheering and chanting and all that jazz, I wasn't joking. Usually I cringe at this type of thing, but Alana was SO motivating and inspiring and passionate that I actually really loved it! The 60 minutes flew, and even though I couldn't feel my thighs when finally dismounted my bike, I can not wait to go back! Really looking forward to trying out a boxing class at BXR on Thursday- stay tuned for a review! Have you tried Psycle? what's your favourite way to workout in London?